Enjoyed having a thread last year to track the standings and playoff odds throughout the season (Link), so lets do it again. 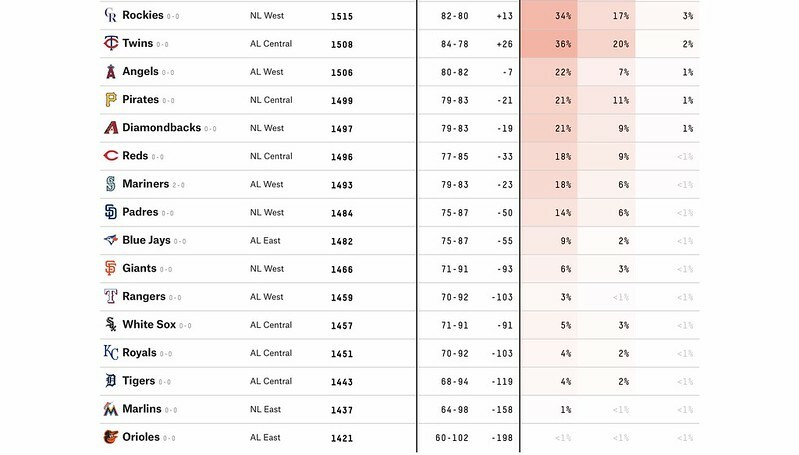 To begin, FiveThirtyEight updated their preseason odds this morning and the Brewers are listed as having the third highest chance of making the playoffs in the National League. They also have the highest playoff odds of any team in the NL Central, and are slight favorites to edge out the Cardinals for the division championship. I meant run differential wise. Although I do think the Twinkies have a shot at them. Just five games into the season and the Brewers are already out to a 2.0+ game lead on the entire division! Extrapolating that out we will clinch the division on either game 116 or 117, which is probably sometime in early August. That will be nice on the late season blood pressure. Last edited by young guns on April 01, 2019, 9:27 PM, edited 1 time in total. Indians probably have the best rotation in baseball. Their lineup is really bad at least while Lindor is out but it should be enough to get them to the playoffs. It's amazing the only thing they did to help their outfield is sign Carlos Gonzalez. I've never seen an outfield for a contender as bad as what Cleveland is trotting out there this year. The Deadspin podcast said it best. The Indians are playing a game to see just how bad they can be and still win the division. The east is stronger than the central. The Marlins and the Padres are going to be the most improved teams in the National League this year. Philadelphia New York and Washington have terrible managers. The west will have the two worst teams in San Francisco and Arizona. The Dodgers are overrated and the Rockies are underrated. The crew’s talent, depth, manager, Front office, late season bullpen and previous playoff experience will help to pull away late from the cards and cubs. Rockies Phillies Mets braves none will best the Crew. I'm trying to decide which I enjoy more...the Brewers being 4-1 or the Cubs being 1-3. This is pretty much the best possible start to the season record-wise. On top of that I love how bad their rotation and bullpen have been. Now it is early and everything could get right for them but those two units looked weak to me before the year started. Well maybe the rotation wasnt weak but it was very dependent on old pitchers staying healthy with very little depth to help. But the Brewers starting 4-1 without Jeffress or Knebel is huge to me. 5 divisional games in and a lot of confidence has already been built. Love the Wilson and Claudio (just needs to be more consistent throwing strikes) additions so far. Phillies will have the best record in the NL this year, Dodgers next best, and the Brewers will edge out the Cubs/Cards for the Central crown. But the fact that all the wins by the Brewers will be by 1 or 2 runs, we may have already had heart attacks. Whenever some ballplayer comes up with lightning fast speed, but questionable OBP skills the often quoted comment is "you can't steal first base". I think for the Indians the corollary would be "you can't win a game if you don't score". Yeah they have a good rotation and a very spotty bullpen, but that offense has the capability of being absolutely abysmal. The Indians are my pick for surprise failure this year. While there's no competition from the Royals, Tigers or Sox, I think the Twins have a very good shot at taking the central. The Twins certainly have the offense to give them a run for it. I'm not a huge fan of their pitching in general, but offense wins in the regular season...pitching wins in the playoffs. If they stay healthy, that Phils squad is crazy good and is going to just mash in that bandbox ballpark this summer. I disagree with a lot of this. The Central is better than the east. The Marlins offense is pathetic, their bullpen is awful and their rotation has inning issues. The Padres are going to be sub .500, they are a bad version of the Pirates. I can see their wins being padded by interleague, I haven't looked at it much to be honest. 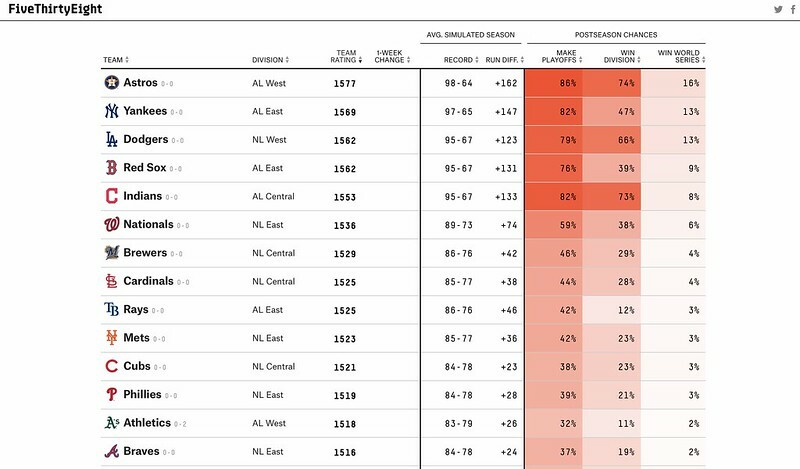 The two worst teams in the NL are the Giants and the Marlins most likely. The Dodgers are underrated, easily best team in the NL, the Rockies are insanely overrated, it is a bad lineup outside of Coors a bad bullpen and a seriously overrated rotation, I think they are going to finish sub .500. Last edited by Ennder on April 03, 2019, 11:54 AM, edited 1 time in total. Isn’t that what Baseball Prospectus or Fangraphs had them at? My Cubs fan coworkers in AZ are panicking. In all seriousness, I think it did quickly adjust to move the Cubs up to an 80 win projection. I see SD putting a decent season together. I think AZ and the Giants are a mess and I'm not sure what to make of the rockies. I think they end up about 86 wins. We'd all love to see the cubs fall off a cliff and not even be close to the payoffs but I think they give us a run if darvish can figure out how to get past the 2nd inning. Bottom line: the NL is ridiculous this year.